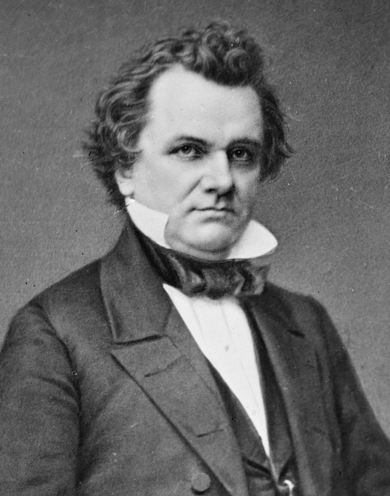 On Christmas Eve 1860, Senator Stephen A. Douglas, the “Little Giant” from Illinois, attempted to solve the sectional crisis by offering two constitutional amendments as compromise measures. Following the example of his Senate colleagues John J. Crittenden, Andrew Johnson, and Jefferson Davis, Douglas submitted a joint resolution aimed at appeasing the South by affording slavery greater federal protection. When the population of any western territory was sufficient for statehood, the state would be admitted with or without slavery as the territorial inhabitants so desired. Douglas’s second amendment reflected Senator John Crittenden’s earlier proposal in many respects, but embodied two significant additions. Possessing racist views shared by most white northerners, Douglas sought to prevent free blacks’ participation at all levels of government and to devise a means of deporting free blacks at the request of the various states. Over the next three months, eight other proposals to amend the Constitution in order to solve the national crisis included clauses prohibiting “persons of the African race” from voting or holding political office. Like all but one of the proposed constitutional amendments offered over Secession Winter, Douglas’s amendment met with the disfavor of Republicans and Democrats alike.